Help Hussain & Hassain Hear Their Mother's Voice! There is nothing more hurting than to watch your child not hear you or absolutely anything in the world. It's more hurting for a mother when it happens to be her twins. But, what a change it would be if my twins can hear me and be like any other children? Do you have a minute to listen to my story? This story is not from a fundraiser - but from a mother who is single and whose heart is heavy worrying about the future of my children. It hurts me that they are not able to enjoy their childhood. 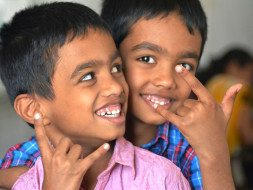 Hussain and Hassian - my twins are with profound deafness. We live in a small village in Bangalore Rural. The doctors at the Bangalore Baptist Hospital tell me that since they suffer profound hearing loss, giving my twins hearing aids will not help. Cochlear implants bypass the damaged area and restore hearing. Providing cochlear implants would restore hearing and help them live life to the fullest! 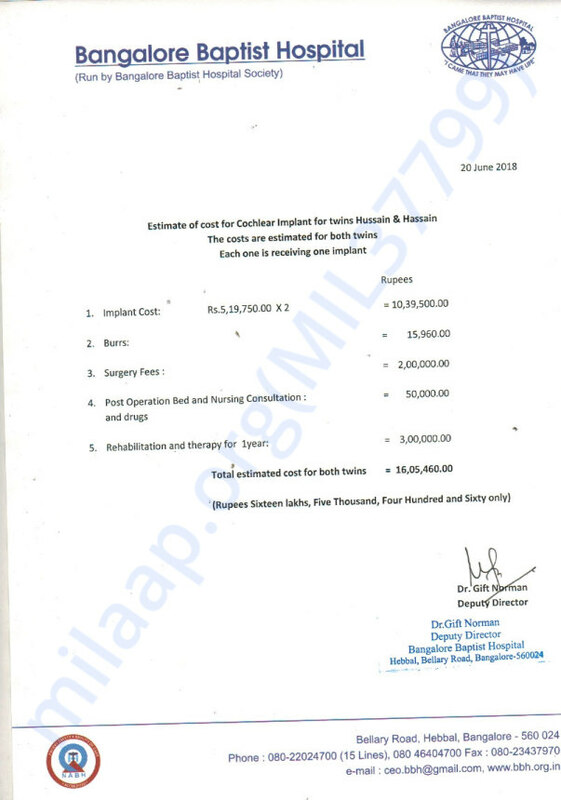 The entire procedure will cost around Rs.14,00,000. I have saved some money and also the hospital has been kind enough to raise some money and are willing to give me some concession. I would still need Rs10,00,000 to make this miracle happen. Would you help me take one step closer to this miracle for my children? Please, while you are reading my letter, would you donate whatever the amount you can and bring in the change for my twins? It hurts me when they show me signs that they cannot hear when they watch TV or what their friends are telling them. Please rush your donation by June 2018. The sooner the implant is done, it's better for the twins. When you donate and the surgery is successfully done, It will be a life-changing "first-time" for my twins! Mother of Hussain and Hassain.